We all know that videos are an excellent way to attract visitors and engage your community. But using them to their full potential is something that many eCommerce professionals have yet to master. Depending on the type of product, the page, and your point in the sales cycle, there are various types of marketing videos you can use to make an impression. An oldie, but goody, product videos are one of the most recognizable types of marketing videos — and for good reason. Product videos show the basics of how a product works and their benefits. They are highly popular because they allow a potential customer to experience a product without being there in person. Product videos are great for home pages and product pages because they help the customer delve deeper into the product once they are already interested in a manner that is both entertaining and informative. Best of all, according to Unruly, watching video ads increases the customer’s desire to buy a product by 97% and brand association by 139%. A great example of a killer video is Dropbox’s explainer video which was the driving force between their 10% increase in conversions, gaining them 10 million total newly acquired users. This video says it all — highlighting all the unique features of the product such as accessibility and shareability. It does so in a way that is extremely clear, informative and entertaining — a successful emulation of the user experience for the viewer. By using a product video such as this on your eCommerce site, you make it easier than ever for customers to get a full range of the product’s most prominent features, making it more comfortable for them to go ahead and make a purchase. A How-to video takes a product video to the next level. This type of video delves deep into the product’s full range of features, explaining step-by-step how to use it. Such a video can stand alone well on a separate page since it is for a more eager, detail-oriented consumer. At times, it can also work as a link from the product page in order to attract customers who are interested in discovering how to best use the product. ZenCash is one example of an outstanding demo video. It’s no secret that collecting client payments isn’t the most engrossing of topics. However, ZenCash’s video, set to upbeat background music and accompanied by interactive illustrations, thoroughly explains their payment collecting platform. And judging by their impressive, 75% click rate ZenCash hit demo-video-gold in displaying this on their company’s homepage. In this video, ZenCash’s stand-out features are made easy-to-grasp, so that any audience can see the benefits of using their platform to take care of nagging invoices and customer follow ups. At 1:30 ZenCash succeeds in explaining their products and features and effectively convincing viewers that their free platform can simplify the B2C transaction process. While related videos are not necessarily a category in and of itself, incorporating them into your site is a great way to help your customers find out more information about the products they are interested in or view other products that are similar. Since people can be reluctant to make online purchases, using this strategy will help them discover all of the facts they need to securely make a purchase. 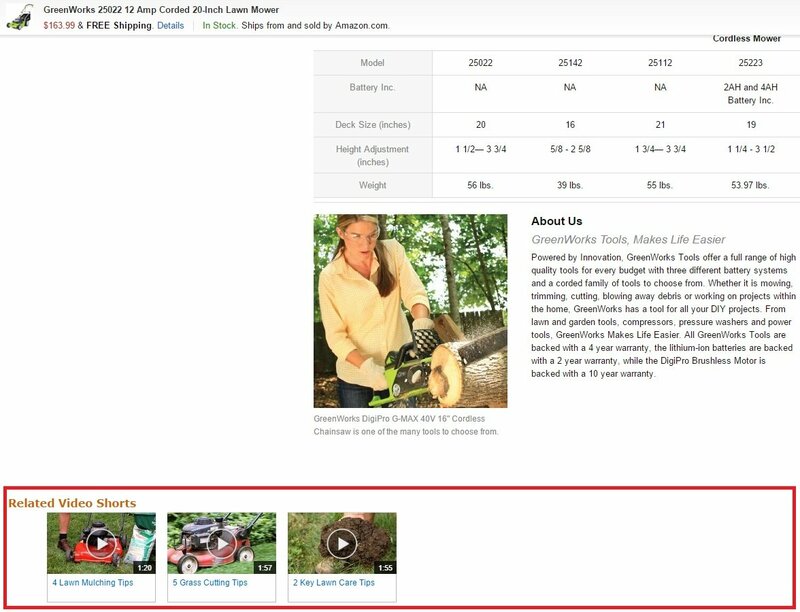 A great example of effectively using related videos can be seen below on Amazon’s site. As you can see, the customer searching for the perfect lawn mower can easily access a variety of videos telling them how to best use the product. This helps them to not only stay on your site longer, but also feel better about making a purchase. As we previously mentioned, your customers are often reluctant to make online purchases. While the reasons for this may vary, often times people feel overwhelmed by the amount of choices that they have. This can inhibit their ability to make a final decision regarding which products best suit their specific needs. It’s your job to remove that stress and give them the tools to discover the pluses and minuses of their potential purchase. Comparison videos are a great way to do that. One great example of a great comparison video is the one below by The Verge comparing Microsoft’s Surface Pro 3 and the Macbook Air. This comparison video is effective because it zones in on all of the features that set each product apart, highlighting the pros and cons of each. Testimonial and review videos are another essential tool for your eCommerce site. The reason people love them is because it gives information about the functionality and quality of the product. Of course, this increases customer’s confidence that the item is useful and works as well as the manufacturers claim. Studies show that video testimonials are extremely effective in converting users. In fact, according to a recent study, the fashion industry experienced a 134% increase in conversions by including review videos on their product pages. While not every industry experiences rates that change to quite that extent, there’s no denying that including testimonial or review videos on your product page or homepage has a huge potential to increase sales and customer loyalty. Interactive videos are a great way to engage users and get them involved in your eCommerce site. What sets these particular videos apart are features such as a call-to-action, a link to access products, or other interactive elements that drive customers to actively participate in the products you’re selling. A great example of an interactive video is the one below by Nike. This video is extremely useful as it displays a product in action while also allowing people to find the product that best suits his or her lifestyle. While we all know marketing videos are extremely effective in boosting eCommerce sales, placing the right kind of video on the right pages can give you the power to take your video marketing initiatives to the next level. By learning about your audience and employing strategic and diverse video content on your eCommerce website, you are sure to see an increase in engagement, sales, and brand loyalty for years to come. This is really good advice, we say similar things to all of our clients. This six types of videos are very good for engaging audience but, Most of our videos are 60 seconds max, any longer and they can run the risk of losing the interest of the audience. Brevity is the key. Animated corporate video is also good for increasing marketing or ROI.